Did you know that, if your property and design satisfy certain criteria, you don’t need to obtain council approval to build a granny flat on your property? The current legislation enables homeowners to get authorisation to build a secondary dwelling in as little as 10 days, without council approval or neighbour objections. Your property must have a minimum block size of 450m² in area. You must maintain a 3m setback from the rear and 0.9m from side boundaries. Your property must be zoned residential. You must maintain a distance of 3m from any existing trees that are over 4m in height. Your property must have a 12m width at the building line of the existing dwelling. Your granny flat must have a maximum 60m² external area. 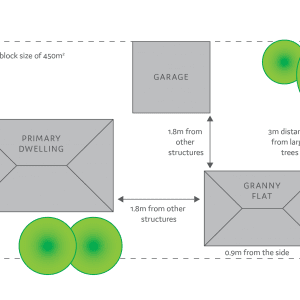 What is a granny flat or secondary dwelling? A secondary dwelling, or granny flat, is a self-contained accommodation which can be separate, attached, or contained within an existing house on a property. It can be a 1 or 2 storey dwelling. If your project satisfies the minimum requirements set out by the NSW Affordable Housing State Environmental Planning Policy, it may qualify as complying development. What is a Complying Development? A complying development does not require council approval and may be authorised instead by obtaining a Complying Development Certificate (CDC). This fast-track planning and building approval process is akin to what is required for building, for example, a swimming pool, or removing or pruning a tree. As such, it is extremely convenient for homeowners looking to expand their living space based on their specific needs. Your property must be zoned residential. Specifically, residential zones R1, R2, R3, R4 and RU5 are approved for complying developments. Your property must have a 12m width at the building line of the existing dwelling. If your property does not meet this requirement, you can apply for an attached or contained granny flat instead. The granny flat must maintain a 3.0m setback from the rear and 0.9m from side boundaries. These setbacks change depending on the height of the granny flat. The granny flat must have a maximum floor area of 60m², as measured from the external wall. However, this does not include verandas, patios, or garages. The diagram above illustrates the requirements for a block of land between 450m² & 900m² in size. These requirements change for properties over 900m². Please refer to Supporting secondary dwellings (granny flats) fact sheet for further details of large site requirements. Complying development is a fast-track approval process which, thanks to a set of prescribed approval conditions, ensures rigorous planning and environmental requirements are respected. By going through this approval pathway, your granny flat may be approved within 10 to 20 days from application lodging. Full development application and council deliberation are not necessary for complying development projects. Have doubts or reservations? Give us a call and our team of consultants will walk you through the process and offer expert advice for your exact situation.